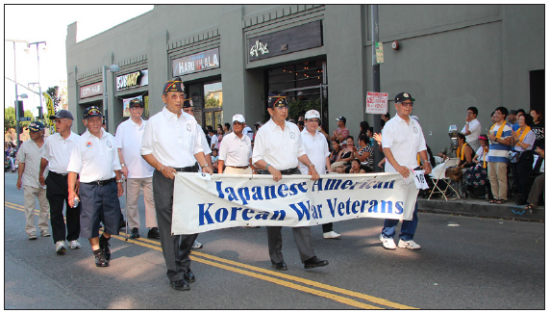 President Tohoru Isobe announced that he has appointed Wally Takata and Sam Shimoguchi as co-chairmen for the 2015 Japanese American Korean War Veterans (JAKWV) Nisei Week activities, and both have promised a great time for veterans and their families on Saturday, Aug. 15, and Sunday, Aug. 16. As always, the Veterans’ Hospitality Room will be located at the Japanese American Cultural and Community Center, 244 S. San Pedro St. in Little Tokyo, on the second floor and is open to any veteran, widows of veterans, and any family member of a veteran, no matter where or when the veteran served. It will be a place for relaxation and renewal of friendships and comradeship for veterans and their families. This also includes any current members of the armed services and their families. At the Hospitality Room, there will be food and drinks, with tables and chairs on the balcony providing a view of the activities on the plaza stage and the concessionaires. The Information Booth will be next to the Japanese American National War Memorial Court, with newsletters, brochures, and books as well as free flowers, which will be given to those who wish to pay their respects to the men who gave their lives in all of America’s wars. Korean War Medal of Honor recipient and JAKWV member Hershey Miyamura from Gallup, N.M., will lead the veterans in the 2015 Nisei Week Parade on Sunday at 5 p.m. Any veteran of the Korean War era is asked to participate. Saturday — Hospitality Room and Information Booth open from 10 a.m. to 3 p.m.
Sunday— Hospitality Room and Information Booth are open from 10 a.m. to 4 p.m. All who are marching in the parade will meet at the staging area at 4:30 p.m.